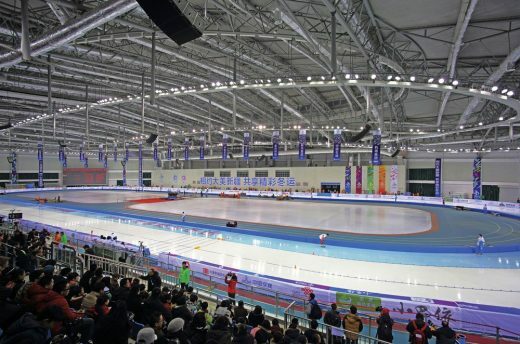 The functional layout design is mainly based on the rational organization of events and the environment space shaping during and after events to provide athletes and citizens with diverse activity spaces, two main entrances provided on the north and south sides of the base, three main venues, i.e. 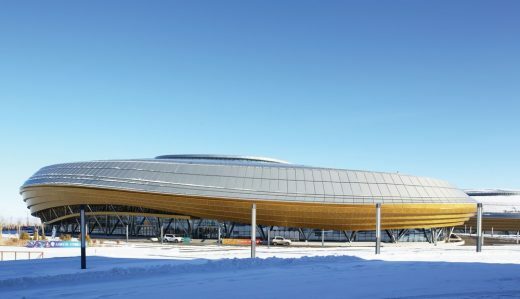 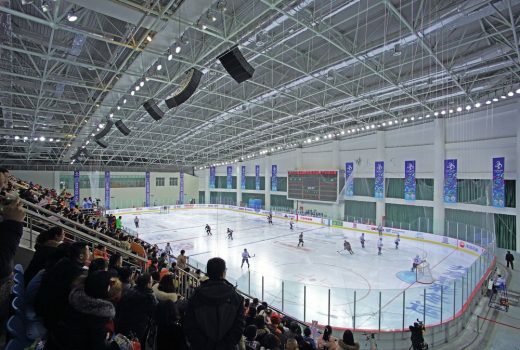 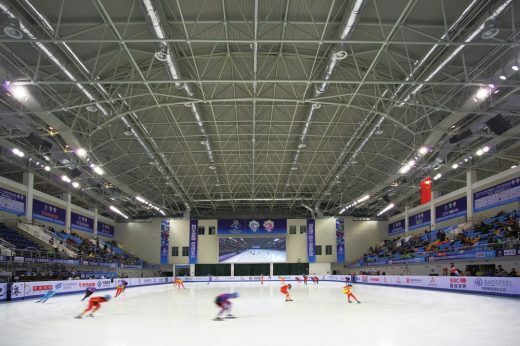 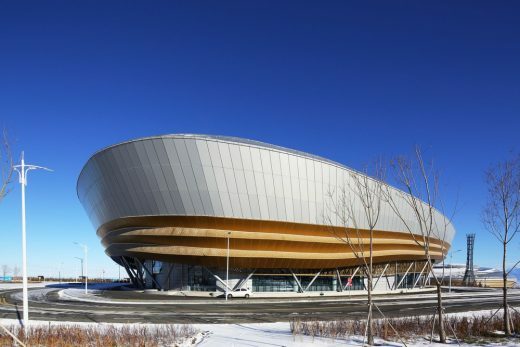 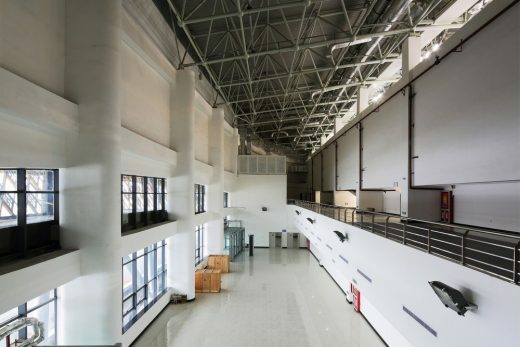 the speed skating gym, the ice hockey hall and the curling hall arranged close to the entrance to facilitate event organization and people evacuation, the athlete apartment and the media center, etc. 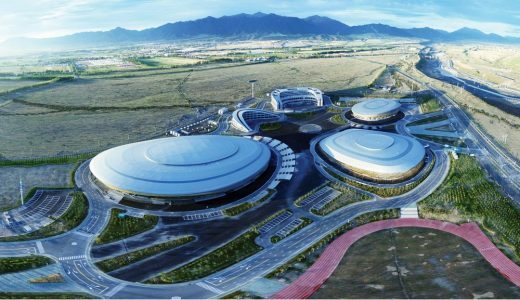 that provide service for sport events arranged on the side far from the city road, the three venues and the medium center showing a ring-shaped layout, like snow lotus in blossom. 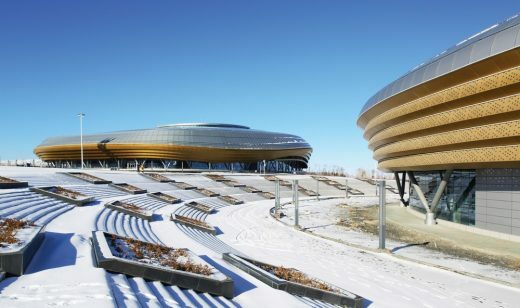 We draw design inspiration from such characteristic features as snow-capped mountains and Gobi unique to Xinjiang, with pure white roofing to outline the shape intention of a natural snow cap, horizontal lines that go through layered processing to simulate the unique rock formations of Gobi, the simulated snowflake crystal on the glass to echo the geographical features of Xinjiang. 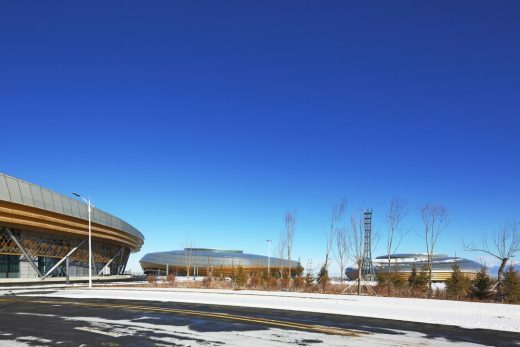 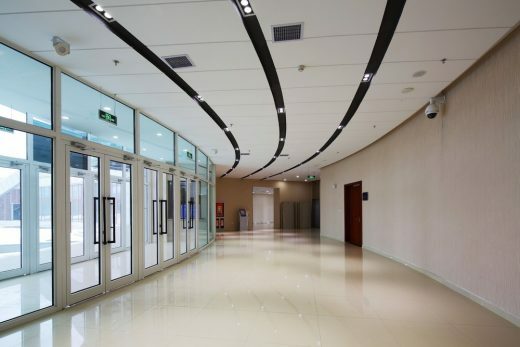 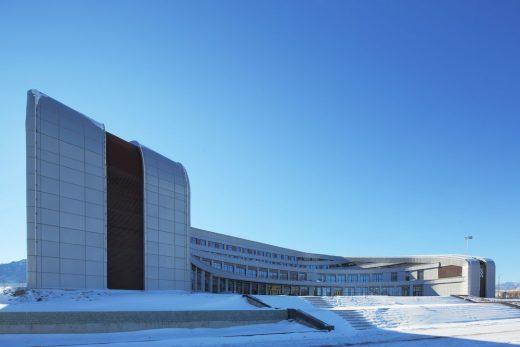 The whole building complex is like being tucked in the snow white, with the facade image decent, elegant and resourceful, in good harmony with the environment, realizing the artistic conception of “Snow Town for National Games at the Foot of Tianshan Mountain”. 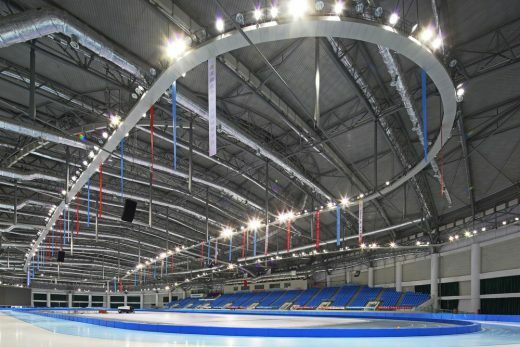 The ice surfaces in all venues involved in the project shall meet the requirements in the latest competition rules 2010 of ISU, with standard tracks with a perimeter of 400 meters used in the speed skating gym, 70m*40m venue used in the ice hockey hall, able to be used for such events as ice hockey, short-track speed skating and figure skating, a 50m*26m practice field arranged on the same floor to provide athletes with warm-up ice surface before the event; the venue size of the curling hall shall be based on the size of an ice hockey venue to meet the requirements of variety of ice sports. 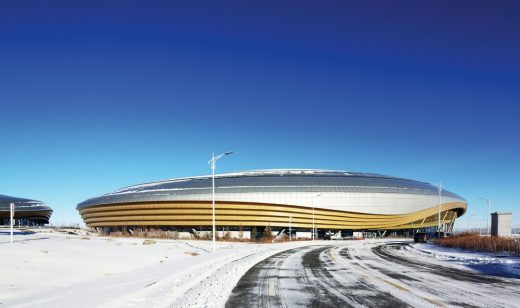 Northeast Based on the location and future function positioning of the base involved in the project, the basic positioning of a sports park is adopted in the design, which can not only meet the requirements of professional sports events but also provide a supporting high-level training base for professional sports teams and provide a new urban tourist destination integrating sports, entertainment, catering, accommodation and shopping after events, with consideration given to both winter and summer seasons. 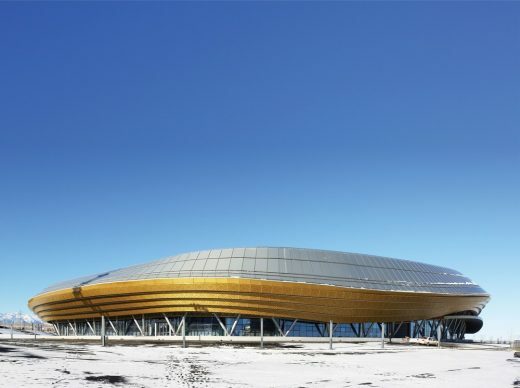 Based on this positioning, inspiration drawn from the unique regional landscapes and traditional culture of Xinjiang, closely centering upon the ice and snow theme, a “Silk, Road, Flower, Valley” design concept is put forward to show the splendid culture and spectacular scenery of Xinjiang.